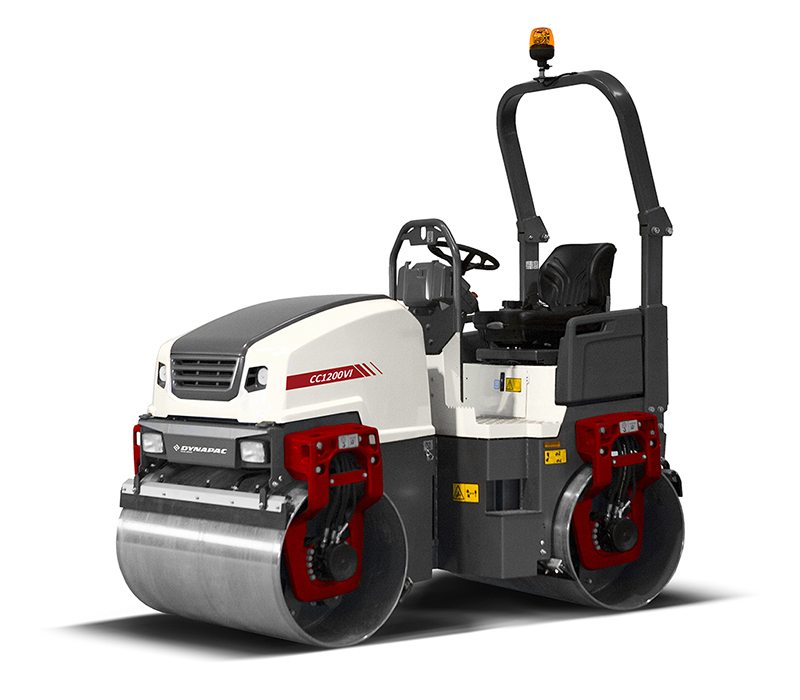 Dynapac introduces the new roller range of CC1100/CC1200, a part of our 6th generation of small asphalt rollers. The new CC1100/CC1200 generation VI is designed to meet the construction industry’s tough conditions with the operator in mind resulting in a robust, comfortable and modern machine for best compaction result. The new machine has a unique design with its cross-mounted engine in combination with an excellent visibility and massive casted forks with built-in flexible lifting/towing/tie down possibilities. By moving the water tank to the rear part of the machine, we have managed to develop a machine with a unique design with a cross-mounted engine in combination with excellent visibility over the drums. The robust engine hood is designed for optimal view over the front drum. The optional sliding seat of 210 mm in combination with the engine hood design gives the operator the best sliding possibilities and visibility on the market. The optional ROPS-mounted working lights in LED will additionally give very good visibility during night-work. mm. Off-setting the front drum makes it easier to compact close to walls and curbs without risk of damages of the machine. The drums have tapered drum edges giving the compaction result a smooth surface without marks. The increased drum diameter makes sure the asphalt is not shoveling in front of the drum creating transversal cracks. possibility to choose between dual frequencies depending on different conditions and applications. An optional front right mounted edge presser/edge cutter is available as well as an optional rear mounted chip spreader. The edge cutter and chip spreader are maneuvered with buttons in the F/R lever. The machine models are also available in a combi-version with 4 static rubber wheels at the rear. sprinkler timer helps the operator in saving water by adjusting the sprinkler intervals which means reduced downtime for water-refilling. The water tank’s volume is as much as 205 liters/54 gal. All this together means less down-time for the operator. enables good operator comfort even during long working days and thereby also increase the quality of the job done. A new optimal comfort seat is available with weight adjustment, armrests and optional seat-heating. The forward and reverse lever is following the optional sliding seat for even better ergonomics and better control. An optional dual forward and reverse lever enables even better ergonomics and control over the compaction process. The new instrument-panel with keypad buttons and a display showing the most important functions facilitate the driver to operate the roller in a controlled way. A small storage box under the seat, a 12 v outlet on operator platform, as well as a cup/can holder on the operator platform facilitates drivers comfort. An optional canopy protecting the driver from different weather conditions facilitates operator´s efficiency. The canopy is foldable for easy transportation. Easy transportation Fast and easy transportation between jobsites increases the operator´s time efficiency. The design work has resulted in flexible lifting/tie down/towing possibilities built-in in the casted forks thus enabling fast and easy transportation. An optional central lifting point is available which makes the transportation between jobsites easier. The foldable ROPS is easy to fold. The total machine length including the ROPS is 2400 mm which means the machines can be cross-loaded on a truck enabling twice as many rollers can fit on a truck. Interlock is standard on all machines ensuring no accidental starting. Failsafe brakes applies automatically if needed. The separate parking brake switch on the instrument panel helps preventing accidental activating. The operator platform is lowered making it easy to enter the machine, this in combination with an ergonomic footstep and sturdy handgrips makes the machine safe to enter. sulfur fuel we offer a stage IIIA/T4i 26kW/35hp engine alternative. is easy to reach sprinkler nozzles, water-pump and filter for the watering system. The sprinkler pump and filter are easy accessible behind a cover above the rear drum. Dynapac is a leading supplier of high tech soil and asphalt rollers, pavers and milling equipment, committed to strengthen customer performance. Dynapac is represented worldwide via its own regional sales- and service offices, and also cooperates with an extensive and professional distribution network. Headquartered in Wardenburg, Germany, Dynapac has production facilities in Europe, South America, and Asia. Dynapac is part of the FAYAT Group.